The tiny Piazza di Trevi has been immortalised through this fountain, built for Pope Clement XII. Arguably the most famous and most beautiful fountain in all of Rome, and the largest Baroque fountain in the city, the statues adorning this watery display represent Abundance, Agrippa, Salubrity, the Virgin and Neptune guided by two Tritons. The fountain marks the terminal point of an ancient aqueduct that supplied Rome for more than four hundred years. The story of the discovery of the spring of fresh water channelled into this aqueduct is represented on the fountain's facade. Tossing a coin into the fountain (over your shoulder, with your back turned to the water) is supposed to guarantee a return trip to Rome. This well-known myth has ensured that thousands of euros are thrown into the fountain every day by tourists desperate for a chance to return; the money is used for charitable projects so visitors are at least supporting a good cause, although often unknowingly. There are regular attempts to steal money out of the fountain as well! 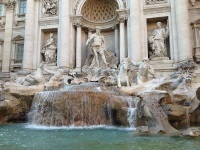 The Trevi Fountain has been immortalised in many films and has become a top attraction in Rome. The best time to visit is at night when it is stunningly lit up.